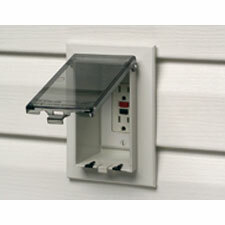 Arlington's one-piece IN BOX™ series, the recessed electrical box for exterior use, eliminates installing multiple pieces - an electrical box, bubble cover assembly, a siding block on siding. And the job looks great because IN BOX™ installs in the wall, so less shows outside. It's that simple! IN BOX™ meets 2014 NEC Section 406.9 (b) where a weatherproof-in-use cover is required for 15 or 20 amp receptacles installed outdoors. IN BOX™ is available in vertical or horizontal with clear or paintable white covers.